Please keep in mind that whenever you voluntarily and publicly disclose personal information on any online service or website - for example on message boards, through email, or in chat areas - that information can be collected and used by others. If you post personal information online that is accessible to the public, you may receive unsolicited messages from other parties in return. Further, whilst we strive to protect your personal information, Colan Australia cannot ensure or warrant the security of any information you transmit to us, and you do so at your own risk. You are solely responsible for maintaining the secrecy of your passwords and/or any account information. This privacy statement details the privacy practices for Colan Products Pty Ltd trading as Colan Australia on our website www.colan.com.au and what information we gather, how we use it and how to correct or change it. This statement only addresses our activities on this website. Other sites including those to which the Website links and third party sites or services with which www.colan.com.au is connected may have their own privacy policies and practices, which we do not control. They each will have separate privacy and data collection practices independent of Colan Australia and Colan Australia has no responsibility or liability for these independent policies or actions and is not responsible for the privacy practices or the content of such websites. Colan Australia will not disclose any information about any individual without the individual's consent, except to comply with applicable law or valid legal process. There may be cases in which some of your personal information may be used by Colan Australia to target e-commerce promotions and telemarketing activities. In addition, it may be shared with third parties who assist Colan Australia in producing its Web sites or provide a service to Colan Australia’s users. When purchasing from Colan Australia your financial details are passed through a secure server using the latest 128-bit SSL (secure sockets layer) encryption technology.128-bit SSL encryption is the current industry standard. 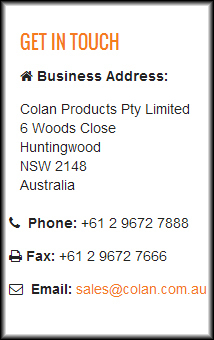 If you have any questions regarding our security policy, please contact our customer support centre sales@colan.com.au.